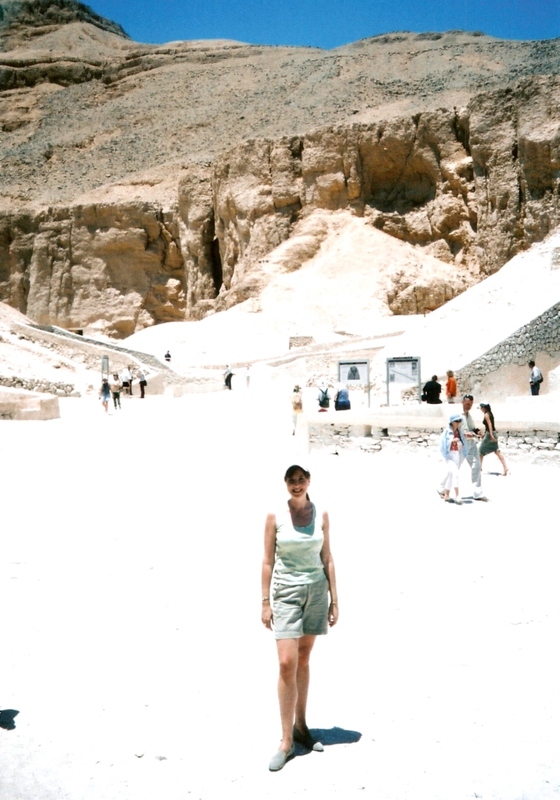 I’ve visited Egypt 11 times in total, since falling in love with it on my first visit with my parents in 1983. 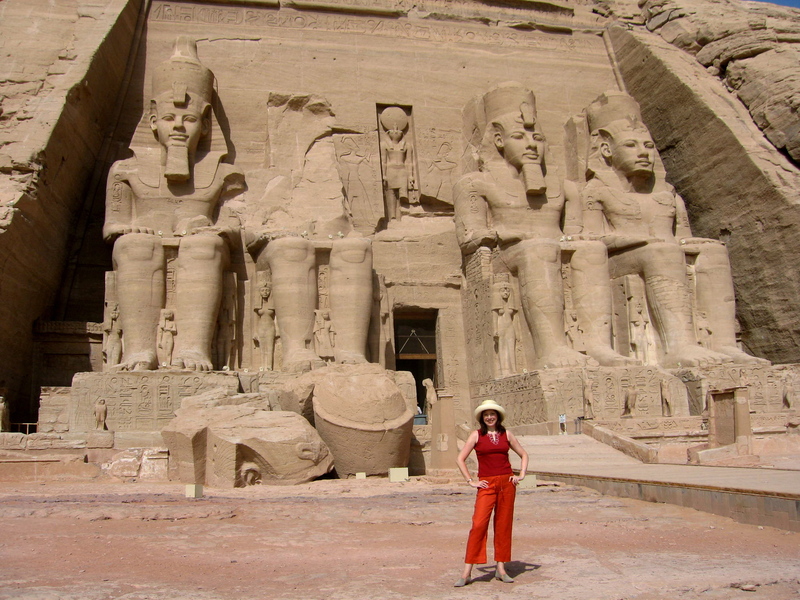 Now I write a fictional adventure / mystery series set there : Meredith Pink’s Adventures in Egypt. There are six books in the series so far. Each is a modern adventure with an ancient Egyptian mystery at its heart. So, in at number 10. The stepped pyramid at Sakkara (or Saqqara as it’s sometimes spelled). 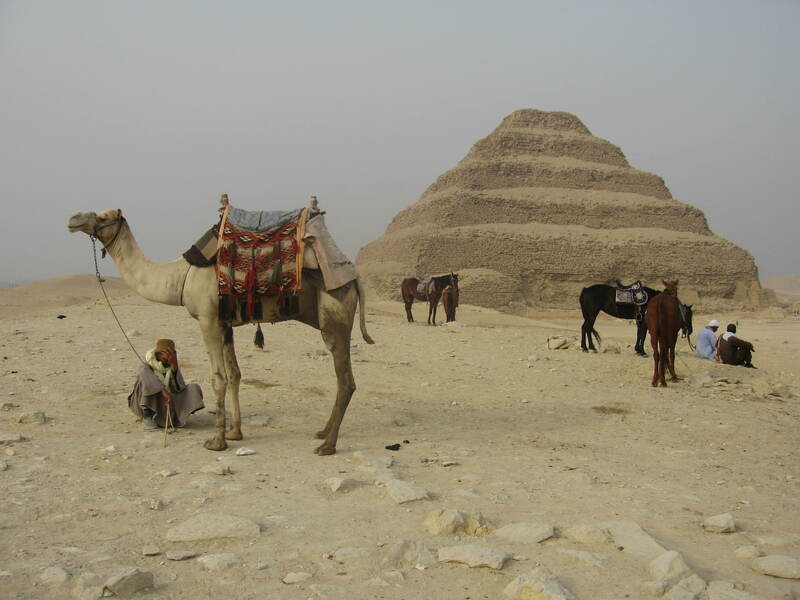 My lead characters Merry and Adam take a trip to see the stepped pyramid in my first book Carter’s Conundrums. II was last at Sakkara in 2008. 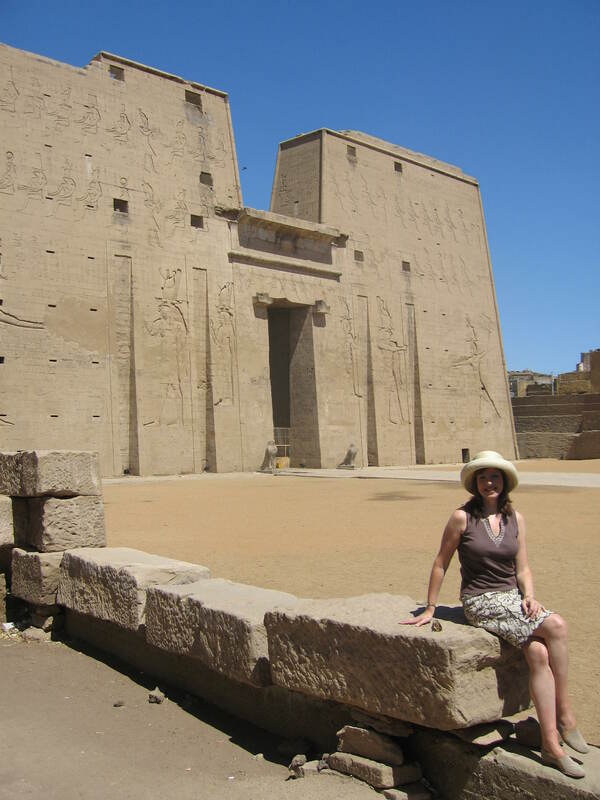 At number 9, the Temple of Edfu, probably the best preserved of all the ancient Egyptian temples. It dates from the Graeco-Roman period, and is included on any Nile cruise itinerary. 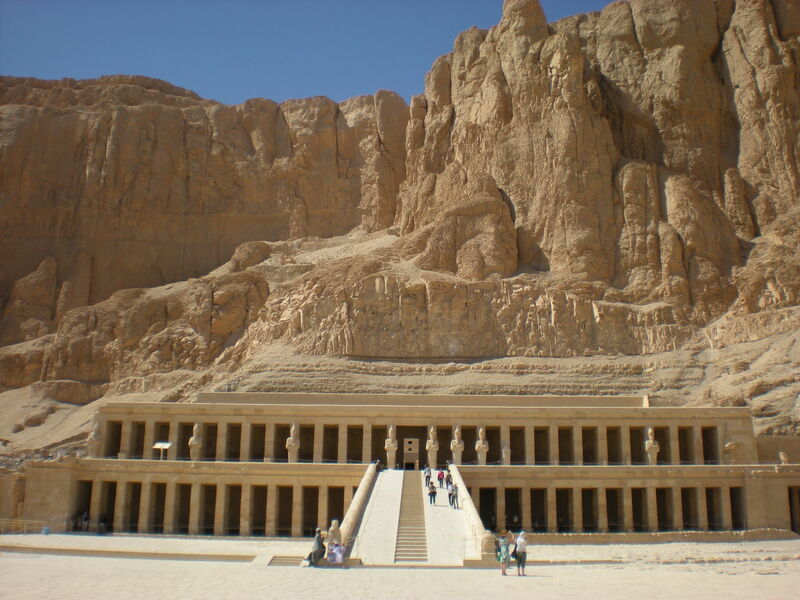 It’s the location of a scene in Hatshepsut’s Hideaway, the third book in my series. Here I am outside the main pylon – March 2008. At number 8, the Temple of Philae, near Aswan. It’s a lovely temple, also dating from the Graeco-Roman period, and dedicated to the goddess Isis. It was rescued by UNESCO as after the British dam was built in the early twentieth century it spent half the year under water. UNESCO moved it piece by piece to the nearby island of Agilika. Not yet used as a location in my books. Here I am in January 2012. 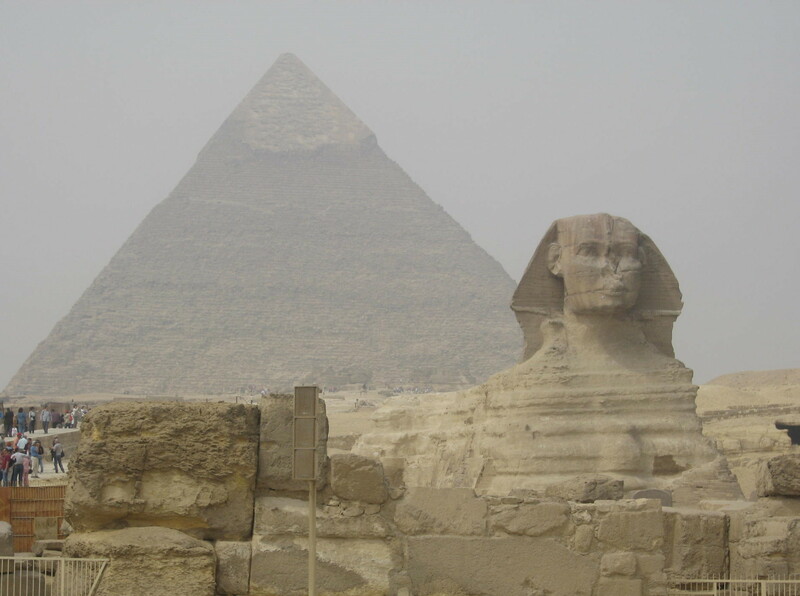 Number 7 is the pyramid and sphinx (not sure if it’s cheating to put them together) on the Giza plateau in Cairo. The pyramids tower over the surrounding suburbia. Merry sits near the swimming pool in Le Meridien hotel, gazing in awe at the pyramids in my second book Tutankhamun’s Triumph. 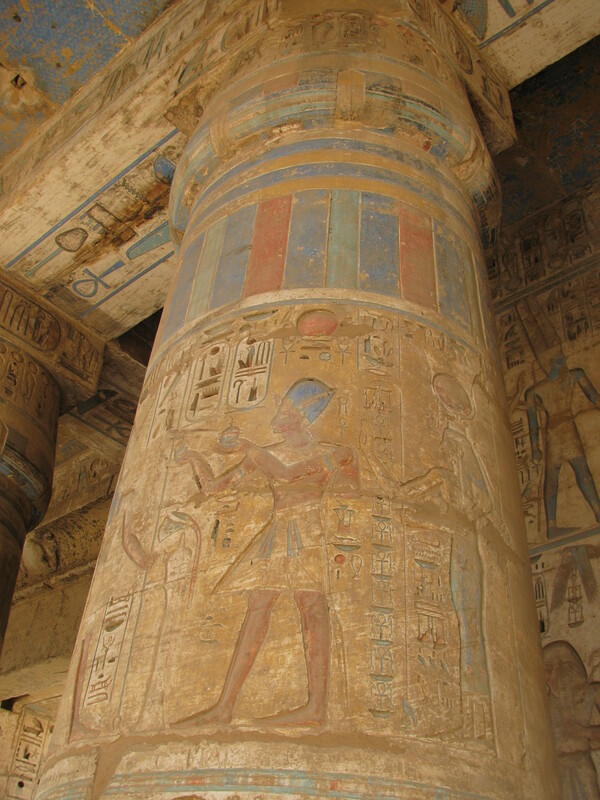 At number 6, I’ll go for the Temple of Medinet Habu, built by Ramses III and located on the West Bank at Luxor. It’s not always included in the touring itineraries, but well worth an independent visit. The original colours are beautifully preserved. Not yet used as a location in my books. At number 5, The Valley of the Kings. A barren, desolate and rather forbidding place … once stuffed with enough gold to sink a battle ship, buried in the tombs of the dead pharaohs. It’s forbidden to take photographs nowadays – so here’s one of me taken back in 2004. The Valley of the Kings features prominently in all of my novels. Number 4, the wonderful Winter Palace hotel. I was lucky enough to stay here for New Year in 2008-9; the best New Year’s Eve ever! Frequented by both Howard Carter and Lord Carnarvon in the years leading up to the 1922 discovery of Tutankhamun. 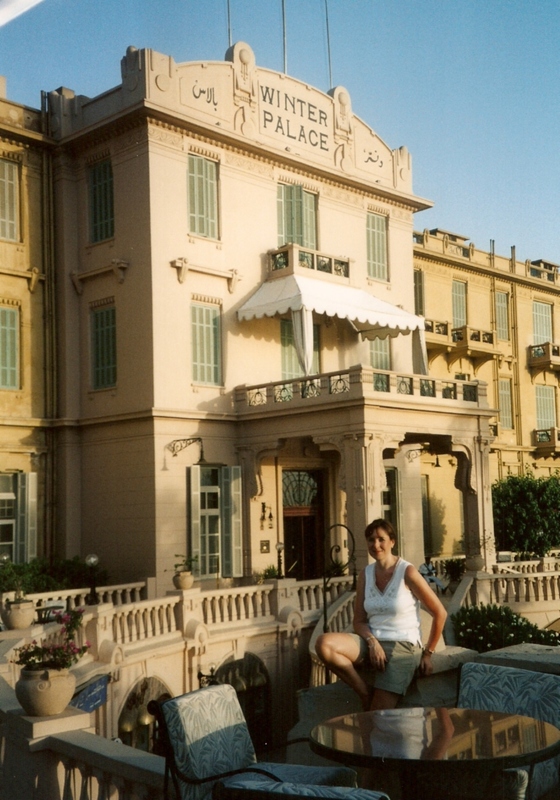 Once used literally as a palace for King Fuad and King Farouk I used it as a location in both Carter’s Conundrums and Farouk’s Fancies. So, to my personal top 3. At number 3 I think it has to be Hatshepsut’s Temple on the West Bank in Luxor. It features prominently in all six books. Set dramatically against the craggy cliff face at Deir el Bahri, and backed by the Valley of the Kings, it’s rich with dramatic potential. 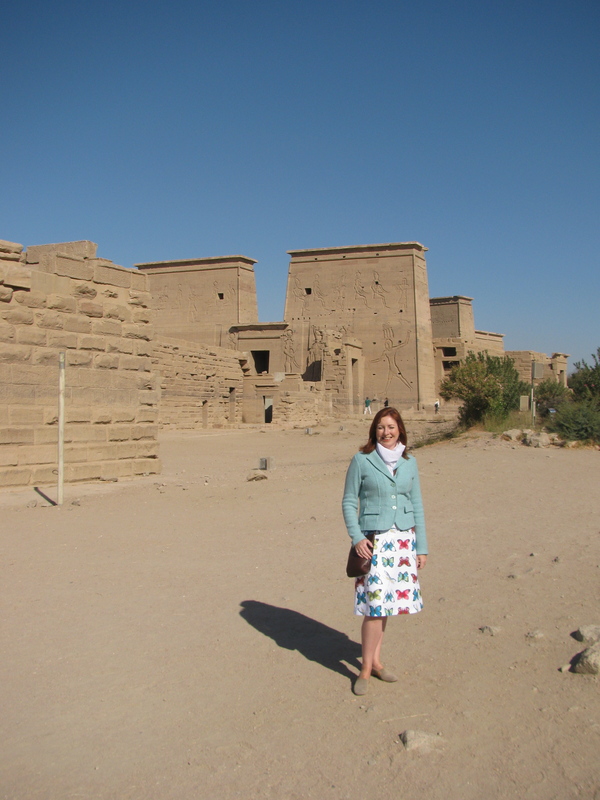 At number 2, the complex of temples that make up Karnak. The Hypostyle Hall takes my breath away every time I go there. The temple is the largest religious structure ever built. Words are inadequate to the task of describing it. As yet, I’ve perhaps not made as much of its dramatic potential as I could. Merry and Adam go there to look at the obelisks in Carter’s Conundrums. So, we’ve arrived at number 1. Personally, for sheer egotistical magnificence, I don’t think you can beat the temples of Abu Simbel, built by Ramses II. Yes, I’m cheating again. 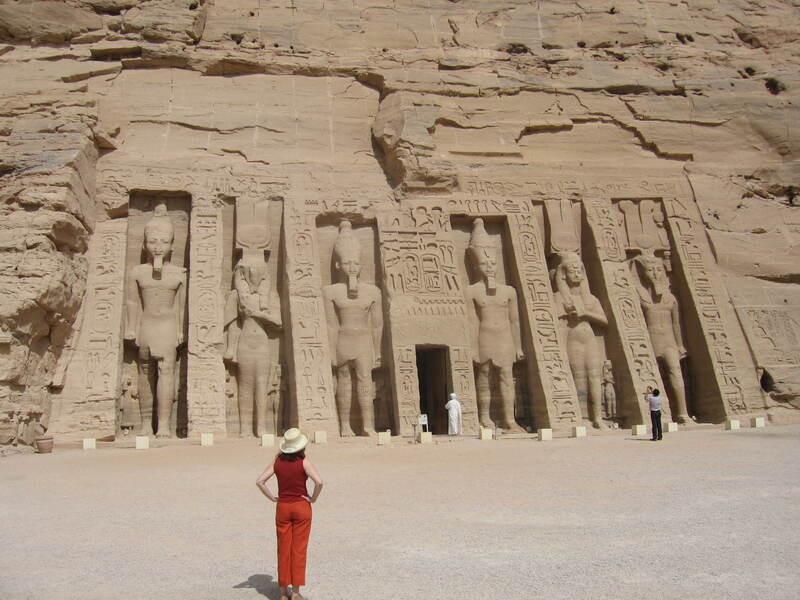 There are actually two temples… one for Ramses himself, and a smaller one for his great royal wife Nefertari. I walked around the latter with a lump in my throat – it’s exquisite. They’re also a marvel of modern engineering, raised to higher ground by UNESCO to escape the rising waters of Lake Nasser. So, there you have it. My personal top 10. 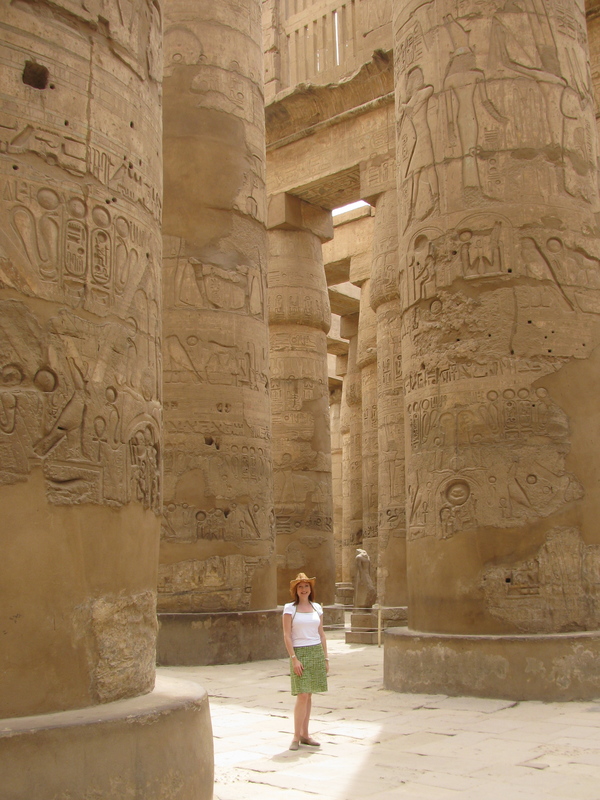 I’ve not mentioned Luxor Temple, the Ramesseum, Denderah, Abydos – all equally awe-inspiring. … Great! Another reason to go back and loads more opportunities for book settings ! I guess maybe I should have done a top 20! Author of Meredith Pink’s Adventures in Egypt, available to download or in paperback on Amazon. Posted on January 12, 2015 by Fiona Deal. This entry was posted in ancient Egypt, archaeology, Egypt, egyptian fiction, fiction, History, holiday, Travel, Uncategorized, writing and tagged Abu Simbel, Abydos, archaeology, Denderah, egypt, Hatshepsut's Temple, Karnak, Luxor, Luxor Temple, medinet habu, pyramids, sakkara, Saqqara, Sphinx, Temple of Edfu, Temple of Philae, Valley of the Kings, Winter Palace. Bookmark the permalink. ← Is it always hot in Egypt…? An excellent choice Fiona, I could read about them everyday. Thanks for posting it.